This perfect little “Yorkshire Terrier” was a very rambunctious puppy. We had to wait and play with this wonderful little puppy for about an hour before tiring. She was 11 months old at the time of this portrait and weighted not even three pounds. She stood 10 3/4″ tall. 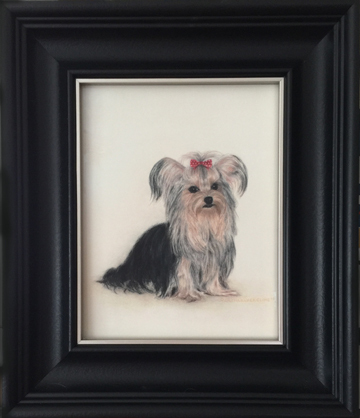 The original pastel painting was her exact height! Twinkle Star was a delight to paint! Once Twinkle Star started to get tired she said so straight and stared at me. 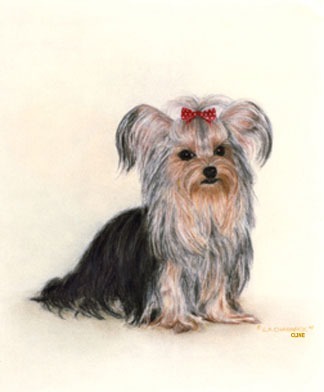 I took out my pad to draw this wonderful little “Yorkshire Terrier Portrait”. Much to my delight she remained still that allowed me to compose a sketch for the painting. Loving animals is a prerequisite to creating portraits. We love our pets!